Mr. McGregor was on his hands and knees planting out young cabbages. Those words from the tale of Peter Rabbit preceded the big chase scene where McGregor ran, hoe in hand, after the terrified Peter. When I planted cabbage plants in my own garden, I often thought of Peter Rabbit and his love of vegetables. I, however, installed rabbit-proof fence around my plants and my cabbages were able to grow into large, weighty heads with beautiful, waxy leaves without interference from rabbits or other hungry creatures. Cabbage is versatile - steamed and buttered cabbage is a wonderful side dish any time of the year; stir fried cabbage has a delightful texture and flavor. Shredded cabbage turned into cole-slaw adds just the right tang to a great fish dinner and stuffed cabbage is like serving little wrapped packages filled with amazing flavors. And, what would a Rueben sandwich be without sauerkraut, (pickled cabbage)? Yes, cabbage is a mighty vegetable. Today's recipe for Butter Beans and Cabbage Soup illustrates another great companionship - beans and cabbage. This hearty soup does not take long to make and is also very economical. I hope you like what I did with the second can of beans! Add first can of beans and next eight (ten if using optional) ingredients to a large pot. Bring to a boil. Remove any foamy residue with a spoon. Lower the heat and simmer until vegetables are tender. Empty second can of beans into a food processor or Vita Mix and pulse until evenly blended. Pour into soup mixture and stir. Heat through. 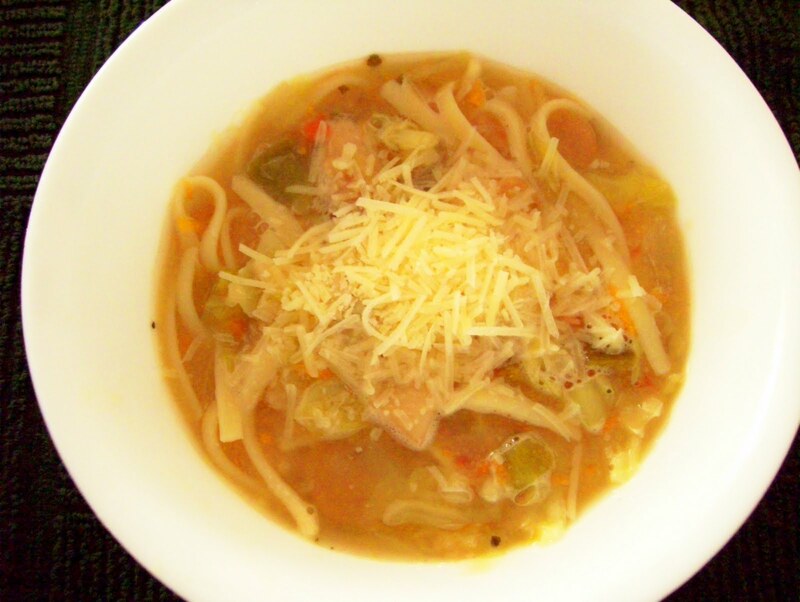 Cut cooked linguini into 4-inch pieces and add to soup. Stir and heat through. Ladle soup into bowls and sprinkle with Parmesan cheese if desired. Serves 6.